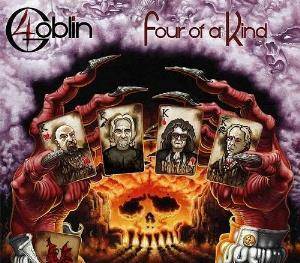 Four Of A Kind is a welcome 2015 return from the Italian masters, Goblin. Not to be confused with Goblin Rebirth, which has the same rhythm section, Claudio Simonetti's Goblin (aka Daemon) or the original Cherry Five. If you are confused by the concept of two separate Yes tours, then a dip into the history of this outfit will prove as labyrinthine as the plot for one of the horror movies they are most famous for soundtracking. The original crowdfunded offering is now re-released by Italian Prog label Black Widow, with a bonus live track Goblin, taken from 1976's Roller, making a welcome addition to that label's already impressive catalogue. If the original release came as something of a surprise, it was clearly not an unpleasant one. This collection of instrumentals demonstrate why Goblin remain revered amongst devotees today. As might be expected, there is a cinematic quality to the music, brooding, intricate and tense, each piece deserving of its own storyline. In Love & Hate as an example, the aching lyricism of one gives way to slashing, squalling brutality of the other as the two extremes vie for a resolution which never really comes. Dark Blue(s) sees a soulful Floydian guitar excursion slowly giving way to a relentless choral chant. The listener is invited to provide their own stories as the music fills spaces in the imagination. Despite, or maybe because of the multiple changes in line up there is no ego on display, the band seem comfortable in their spaces allowing the excellent rhythm section of Fabio Pignatelli (bass) and Agostino Marangolo (drums) to push themselves forward with great freedom. For a band often associated with horror, this was indeed a treat, perhaps ironically lacking only the killer element to seal the deal. Nonetheless, this is a quality release from an ensemble who really know their business, have style and the ability to accomplish great feats of musical skill with ease. It is marvellous to see this incarnation on the road and clearly still enjoying themselves and looking to the future where others of their generation are simply cashing in on the past. New music from masters of the genre is always something to be treasured and this refreshed output from one of Italy's finest is no exception.